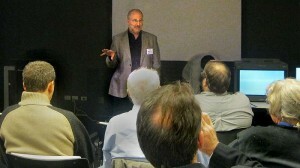 John Maizels welcomes attendees, and reminds any non-members to join SMPTE and for all to attend the forthcoming SMPTE 2011 Sydney Conference and Exhibition. 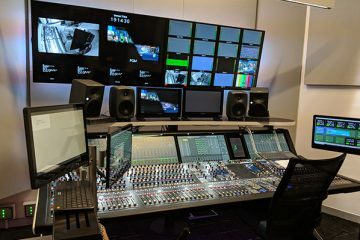 Productions, careers and reputations are made (or broken) by how well pictures can be graded and evaluated instudios, master control rooms, edit suites, grading suites, and OB Vans. For the last half decade the manufacturers have ceased production of our main tool of trade, originally adopted in 1937, the precision CRT video monitor. For the last few years, we’ve had to get by with using our aging and dying stocks of CRT monitors, or resorting to new “professional” LCD displays with a variety of inherent and unfixable issues, such as high black levels, different gamma curves, white clipping, viewing angle issues, motion processing and blurring, latency, and the need for lossy rescaling to show raster sizes different to that built into the display itself. At the same time, the consumer viewing market has been flooded with LCD and plasma screens that seem to follow no industry standard, and which in any case have characteristics of image reproduction that are unrelated to the “known” and standardised characteristics of correctly-aligned Grade 1 CRTs. Then we have the variations of signal presentation to the consumer’s display (composite, component, decompressed MPEG, and various resolutions) and of course the mixing and mismatching of aspect ratios. SMPTE is here not only to create useful standards for our industry, but to support its members in their professional endeavours, so SMPTE.au leapt at the opportunity granted by Sony to show a significant contribution to resolving these dilemmas, the OLED display. 35 industry professionals participated, with backgrounds significantly covering those areas most affected by the “monitoring problem”. For a fascinating “plain English” white paper explaining OLED technology and a comparison to CRTs, Plasmas and LCDs, please refer to the White Paper of OLED. 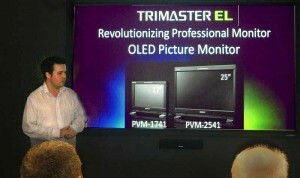 Alex Lofts, Product Manager, Professional Monitors explained the OLED product. THE SONY OLED DEVELOPMENT: A consumer initiative! Sony created their OLED development and manufacturing facility originally to produce superior flat panel screens for the mass consumer market. However, the difficulty of producing flawless screens of large dimensions meant that consumers went for cheaper and larger (yet often flagrantly under-performing) LCD alternatives, and showed little interest in the superior but expensive and smaller OLED offerings. 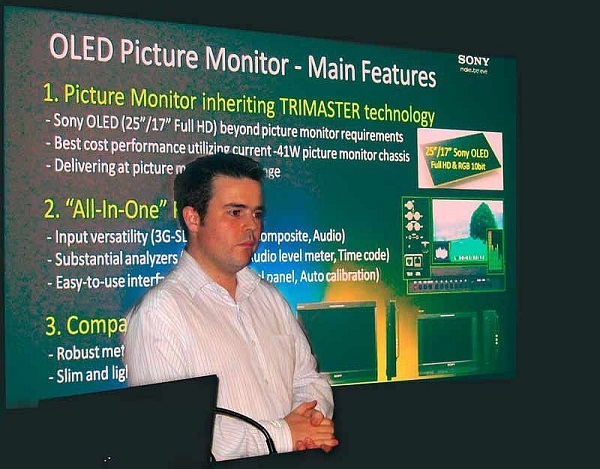 Sony tell us that the OLED manufacturing capability will shortly bring us a new generation of professional and broadcast video monitors, offering the first real substitute for the CRT monitor. This should be fairly life-changing for our industry. We viewed a number of produced HD demonstration videos (the kind you see at trade shows), shot with various cameras and with various contribution recording compression schemes, fed as 4.2.2 HDSDI signals to all monitors. Viewing conditions were under indoor room light and then with the lights switched off. Excessive ambient light washes out the CRT, but the OLED's blacks stay solid. The LCD couldn't make black to begin with! Sony advised that the OLEDs will come in the following sizes: 25”, 17”, 7.4″. With the 25” and 17” there will be 2 models: BVM-E250/170 for critical evaluation and colour grading and the PVM2541/1741 which are more for broadcast applications like camera CCU, post production, colour correction. Price of the BVE250 will be around $25K and the PVM2541 around $6K. The OLED display showed us detail and colour information in darker parts of sample images, which were less visible on the LCD and CRT displays. Although this is a performance improvement due to the OLED’s capabilities, one might wonder about the usefulness of evaluating an aspect of image creation that will be invisible to viewers at home, and thus unrepresentative of how the finished product will appear. The white Sony logo on a black screen showed halation around the whites on the CRT (something we’ve grown used to, and must tend to compensate for in our minds?) This artifact was absent on the OLED display. The poor LCD screen couldn’t even reproduce the black background as black! The LCD’s characteristic motion blurring (due to display lag and to conceal jumpy motion) was absent on the OLED. The CRT characteristically relied upon its inherent phosphor “lag” to conceal jumpy motion. The CRT flickered at the usual frame rate, but the OLED stayed “alight” continuously, simply incrementing pixel values when the incoming data refreshed them at the normal trace rate. We noted that the evaluation was coloured by imprecise alignment of all the sample monitors, especially that the OLED was a factory sample, not a refined release version. We didn’t get to see any SD content on HD, to evaluate any quality loss issues from scaling and re-mapping of 720×576 on to a native1920x1080 HD pixels display. Yes, we still need to examine SD pictures! We were comparing three types of display, but with three different grades of monitors, so this couldn’t really be a “scientific” trial. Viewing conditions are inherently constrained with the OLED’s 60 degree viewing angle. But then again, so are they for LCDs, or comparably for the low ambient lighting constraints required for evaluations with precision CRTs. We discussed aging of OLED displays; half life 50% brightness in about three years of continuous running; how failures appear; dead pixels; (who pays for early appearance of dead pixels on an expensive professional monitor? ); burn-in is also an issue, apparently, but is to some extent compensated for with circuitry. To be fair, compare with the lifespan of CRTs, being typically 2 or 3 years continuous running in a TV studio before tube needs replacing. Consider the cost of tube replacement versus replacement of entire OLED monitor at its end of display life. Sony advises that the expected life for OLED is around 30,000 hours (50% brightness). Panels may be available for replacement, rather than replacing the entire unit. Meanwhile, serious users are hanging on to their best CRT evaluation monitors until the manufacturers can supply credible replacements. One broadcast attendee pointed out that his organisation still had nearly two dozen surviving HD CRT Grade 1 monitors in service, and they saw this as very valuable. Another engineer referred to his continuing adherence as his home viewing choice, to a beautiful classic Sony WEGA CRT TV. SMPTE Board members who organised and promoted the evening: John Walsh, Richard Visser and John Maizels. Alex Lofts, Product Manager, Professional Monitors, from Sony, who gave a very thoughtful and knowledgeable presentation. 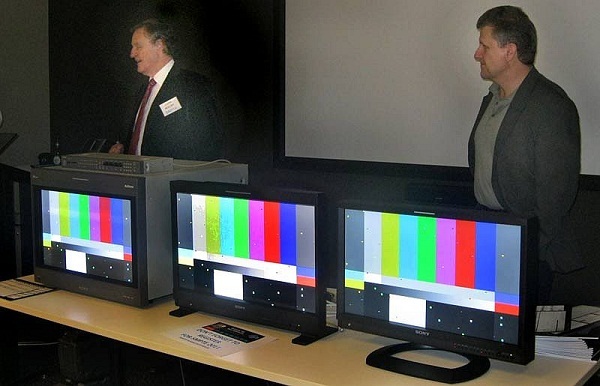 Sony will have the BVM version of the OLED on display, under controlled conditions, at SMPTE’11 in Sydney in July. 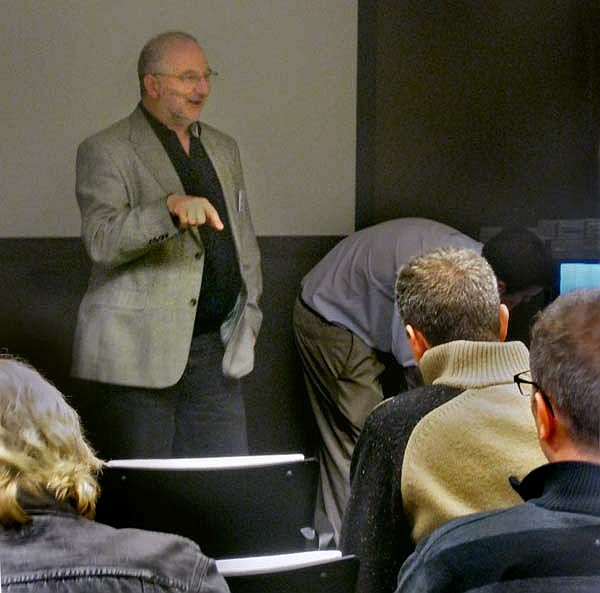 SMPTE.au will have more monthly Section Meetings like this coming your way. Stay in the loop: be there!